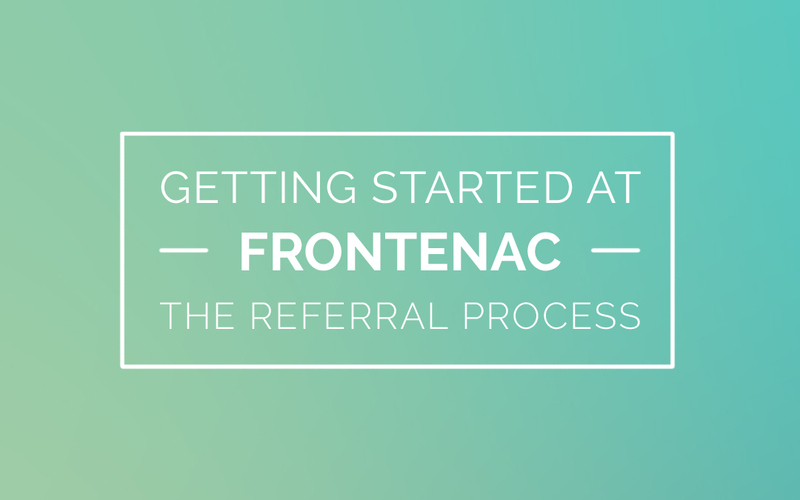 How do I get started at Frontenac Youth Services? A youth 12 + years old or parent/guardian needs to contact Central Intake at 1-888-454-6275 to initiate the referral process. The youth or parent/guardian will speak to a worker and complete an InterRAI Screener to identify what the concerns are and how serious they may be. Other important demographic information is collected at this time. This can take up to 45 minutes. When Central Intake determines that the youth and/or family is suitable to be referred to Frontenac Youth Services, our Intake Worker receives the referral package from Central Intake. Once our Intake Worker receives referral information from Central Intake, the Intake Worker will contact the youth and/or family to schedule an assessment at the earliest time available and one that is convenient to them. Everyone who lives in the home is encouraged to attend the assessment. Prior to the assessment the youth and/or family will be asked to fill out a Consent for Treatment form. Please bring the youth’s health card. Next, a Youth and Family Counsellor will introduce themselves to the youth and/or family and will lead them to a room to begin the assessment. The Youth and Family Counsellor verbally reviews the Consent for Treatment and Rights and Responsibilities as well as discussing the use of the one way mirror, which is voluntary. The family is then given time to sign the Consent for Treatment. The Youth and Family Counsellor will ask important and relevant questions about presenting problems and overall family dynamics to help guide future recommendations. After the assessment (approximately 1 hour), the Youth and Family Counsellor will consult privately with their team members to discuss recommendations. Recommendations will be presented to the youth and/or family along with any consent forms for the release of information from partnering agencies to be signed to help with treatment planning and service coordination. If there are identified risk factors, a Safety Plan will be completed with the youth/family, and a copy given for them to take home. The Youth and Family Counsellor will then ask the youth and/or family about availability for services and place the youth and/or family on the appropriate wait list. Once services can begin, a staff member will contact the youth and/or family to set up the initial appointment. Sessions are initially on a weekly basis and take into consideration the youth and/or family’s availability and the counsellor’s availability. When possible, the appointments are consistently scheduled for the same day of the week and time thereafter. The worker who begins the counselling may be a different worker than the one who conducted the assessment.